Fly Ace Corporation has organized a ’Juice Party’ to support a proposed legislation that aims to enforce consumption of healthy beverage options, particularly in schools. 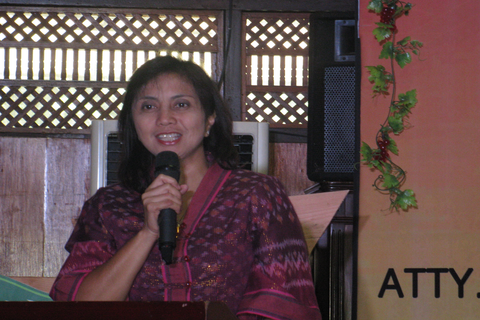 Representative Leni Robredo, who co-authors the bill, was the guest speaker in the event. <>In support of the Healthy Beverages Options Act 4021 of the Philippines, Fly Ace Corporation launched its first healthy beverage fete, entitled “Juice Party” last June 19. 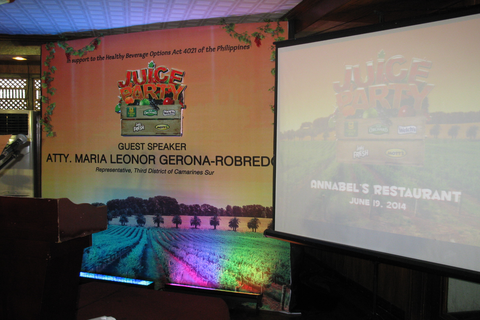 The event, which was held at Annabel's Restaurant in Quezon City, was a celebration on healthy living, aimed at educating Filipinos on the benefits of drinking 100% fruit juice. 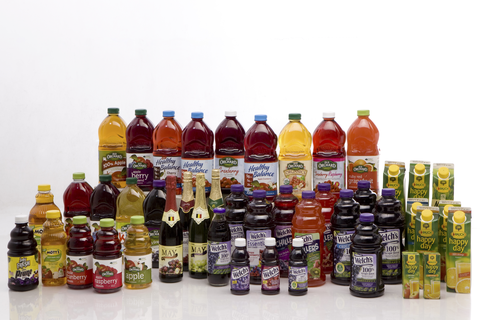 The celebration advocated the consumption of 100% fruit juice as it contains more vitamins and minerals than fruit drinks, sweetened teas, and carbonated beverages. Research suggests that drinking moderate amounts of 100% fruit juice among kids can ensure an overall well-balanced diet, while drinking eight glasses of water a day is still best for kids and adults alike. The event’s guest speaker, Congresswoman Maria Leonor “Leni” Robredo of Camarines Sur, is currently a member of the Committee on the Welfare of Children and a co-author of the Healthy Beverage Options Act 4021 of the Philippines, along with Dinagat Islands Rep. Arlene “Kaka” Bag-ao, also a firm supporter of health and education. She expressed the government’s role in contributing to the well-being of every Filipino, giving emphasis on the active dissemination of health facts through promulgation and direction. Ten-year-old Daniel “Chip” Gatmaytan, a student at Multiple Intelligence School, was also present. He has been campaigning this issue to lawmakers since 2011. House Bill 4021 or Healthy Beverage Options Act insists on the need for the regulation of the availability of unhealthy beverages to children in schools. The proposed statute provides that all schools shall educate the students in the effects of the consumption of unhealthy food and drinks, including sugar, in the body. HB 4021 seeks that softdrinks, drinks containing caffeine and additional sweeteners, and fruit-based drinks with less than 50% real fruit juice be not provided or sold in schools. At the same time, it encourages selling of water, fruit juice with at least 50% real fruit juice content, low- or fat-free milk, and calcium-fortified milk. Speaking before an assembly of journalists, merchants, local officials and health drink enthusiasts, nutrition expert, Professor Luchie Callanta, primed the guests on the importance, manner, and benefits of drinking 100% juice. Prof. Callanta is a known nutrition expert, a former professor at the University of the Philippines College of Home Economics, and currently a faculty member of Center for Culinary Arts, Manila. Professor Callanta shared the Drink Pyramid, which illustrates the types and ideal consumption amount of beverages. On top of the list are beverages that have to be consumed everyday as these are essentials in our fluid intake: water, mineral water, and milk. To be consumed regularly are fruit juices and fruit nectars, while to be consumed sparingly are diet drinks, lemonades, energy drinks, and carbonated drinks. Fly Ace Corporation, one of the leading food and beverage consumer goods companies in the country, presented the fundamentals on 100% juice. There are different types of fruit juice. First is the 100% juice which has 100% real fruit content and is the direct juice from any fruit. This drinkable juice retains its original aroma, color, vitamins and minerals and has no sugar and additives. Nectars contain 25% to 50% fruit juice content with additional water, sweeteners such as honey, corn syrup, sugar and citric acid. Most nectars are made from very expensive fruits, which are too sour or too thick, such as cranberry, passion fruit, peach, or mango. Lastly, fruit drinks contain a small proportion of fruit juice content. Fruit drinks contain sugar additives such as citric acid, artificial flavors, colorants, and stabilizers. There is no constraint in the mixture. Fly Ace Corporation’s ready to drink brands Rauch Happy Day, Old Orchard, Mott’s, Welch’s, and Jolly Fresh guarantee healthy drinking and cover the daily requirement of packed vitamins and minerals through their 100% juice and nectar variants. Drinking fruit juice is especially important in children for better performance, physical and mental equilibrium, and improved concentration. Fly Ace Corporation firmly supports the Healthy Beverages Options Act of the Philippines 4021 and urges everyone to discover the benefits of 100% juice for a smarter, more active, and healthier lifestyle.